I'm a passionate gardener. Once the weather turns warm I will spend every moment in my garden inspecting every garden bed over and over just because I love to see the changes in the garden from day to day. I love "accessories" for my garden. 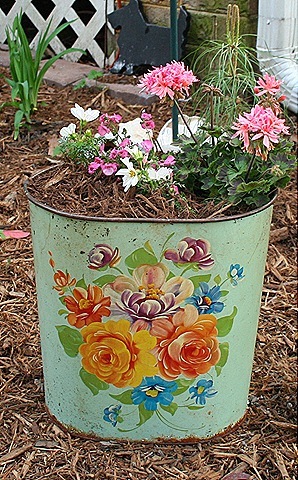 I just love old and rusty repurposed stuff for the garden. I have always got that little idea in the back of my mind when I am thrifting and junking. Hmmm. Could I use that in the garden? An easy item to find while thrifting and junking is old trash cans. Pretty metal ones. You know. Most of the time they are kinda gross, maybe dirty on the inside. But just lovely graphics on the outside. 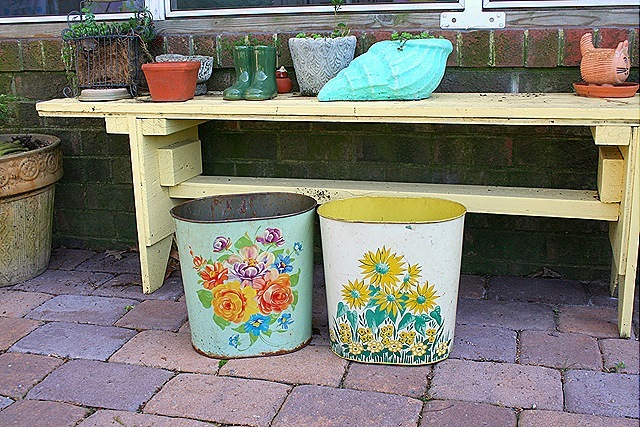 These old metal beauties are perfect planters for the garden. I just drill a few drainage holes in the bottom. Then I give the outside a quick spray with a clear varnish. It helps to prolong the life of the pretty exterior. Add some potting mix and a few plants. I plant some with annuals and some with perennials because I leave these containers outside year round. They are very pretty and such a great idea! I will keep my eyes open for some. I am hoping to plant some containers this year. Seems great minds thinks alike..hahaha…I too love to spend every moment in the garden whenever I can…those vintage trash bins are cute, never thought of doing that. Every spring I try to talk myself out accesorizing my garden due to upcoming hurricane season but it never works…hahaha. Okay, well then head to SuzAnna’s!! We have tons for you to use!! Wait for this newsletter on Wednesday! I have some beautiful metal containers to show!! Inspired….instant character in the garden…you never cease to amaze me! Just found your blog via Vintage Rescue Squad’s blog….love it. I’m a huge fan of the gazillion mile yard sale…go every year. Live in Chattanooga! Hope to see you there! 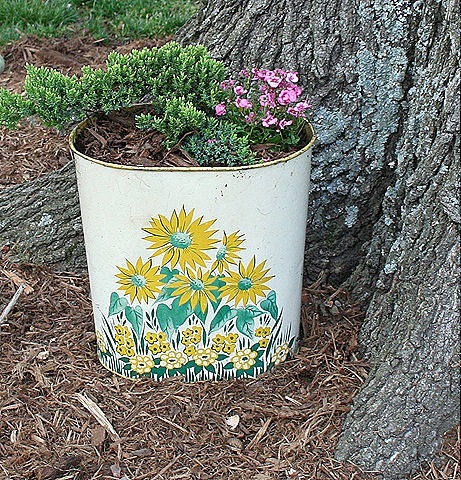 I love that green trashcan planter–great idea! What a cute idea! Love it! Now I’m rethinking my storage idea for shoulder pads in my sewing room. They’re in a vintage jadite green metal garbage can with pink and white daisies painted on the front. Nobody’s wearing shoulder pads anyway, right? I’ve got some time to think about it – we’re not quite ready for planting up here in zone 5, anyway. I love it too, Suzy! Guess what? I was at Walmart this morning and they had that wonderful glue you love, and I bought two tubes to glue stuff out in the yard. (I told the lady working there that it started with a letter and was followed by four numbers. That was all I could recall!) I posted last night on whimsical things in the garden too. Great minds think alike. Now gotta drink my coffee and get back out there! Although I have a garden…I’m not a gardener by any means, but I have been wondering what I might use as a planter that is different and cottagey for each side of my door…now, I know. Thanks!! what a great fun idea! You rock! I have the same aqua trash can in my bedroom…but, mine wasn’t cheap, it came from eBay. I just never see these wonderful vintage things at our thrift stores. I love flowers and planted some this week, but it won’t be long before the awful heat comes and fry everything. Again we are twin daughters of different mothers…have some of these myself. Isn’t it great to be back in the garden again? It’s my favorite place to be too…the garden….and estate sales. Mmmm!!! The morning fog & dew have almost burned off, and then I am out for my FIRST day of gardening of the season ~YIPPEE~ !!!! Way to go! I’m not too disappointed when items aren’t perfect when thrifting, because damaged items get to go into the garden. I love these trash cans too… I actually have them in my home as trash cans….but I will definately try using them as planters…maybe even try it as a vase with twigs coming out of them…Loving all your yards art!!! beautiful!! what a fantastic idea! maybe I’ll find some cans at the thrift store! I have a few that I use as trash cans, but they have seen better days. What a good idea to reuse them as planters! They look really pretty. Great idea for making the planters with used stuffs.